Presidents’ Day, celebrated today, started to honor George Washington. Since Abraham Lincoln’s birthday was February 12, he also receives special homage in February. Since I’m still making recipes from the1860s, I found a Lincoln-inspired recipe for “rail splitters” in The President’s Cookbook, by Poppy Cannon and Patricia Brooks (1968). Lincoln’s background as a lawyer raised in a log cabin figured prominently in his political biography as he campaigned for the Presidential nomination in 1860. 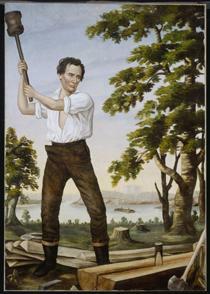 At the national convention, a cousin went to the backwoods Illinois home where Lincoln was raised and brought in a fence rail that Lincoln had indeed cut with a sign proclaiming “Abe Lincoln the Rail Splitter.” The tactic to glorify Lincoln’s humble background worked, and Lincoln won the nomination. This rustic recipe for corn muffins is named in Lincoln’s honor. I don’t have a cornbread-stick pan, so I used muffin tins instead. The batter, with its mix of acidic buttermilk and baking soda, foamed up like a science experiment, but it baked into tender, if crumbly muffins that Abe might have eaten for breakfast back in the day. Below is my adaptation of The President’s Cookbook recipe. Preheat the oven to 375 degrees. Butter a cornbread-stick pan or 12 muffin tins. In a small bowl, sift together the flour and baking powder. Set aside. In a large bowl, beat the egg. Add the sugar, salt and corn meal. Mix together and add the shortening. Mix again, add the buttermilk, and stir to combine. Add the baking soda/water mixture to the batter, followed by the flour mixture. Stir until well combined. If using a cornbread-stick pan, heat to the sizzling point. Pour in the batter. If using muffin tins, fill each cup approximately 3/4 full. This entry was posted in cookbooks, Food, history and tagged 1860s, Abraham Lincoln, butter, buttermilk, corn meal, muffins, Presidents Day, U.S. Presidents. Bookmark the permalink.